Created in 1939, this book is most impressive and has its sights on Germany. Tintin finds a brief-case on a park bench and this leads him to Prague, then to Syldavia. He will save the Kingdom from being overthrown by a fascist "coup d'état".. The cover of this book as shown here, is worth a closer look. In fact, it is the 1942 version which has been reworked by Hergé. Compare it with this version (see inset) to appreciate the way that the parchment helps to emphasize the lettering of the title. Not often seen for obvious reason, their garters are a revelation. Today, this fashion item has totally disappeared. However, who can be 100% sure? We discover visually this fashion accessory when the Thompsons are almost blown-away by the explosion of a bomb. You won't find Syldavia on the map. It's a pure Hergé invention, with its own history and language. Based on cockney Brussels slang, with a touch of French and Dutch, and rounded-off with some Slav words, we end-up with "politzski" for "police". Simple, to say the least! Here we meet, for the first time, the most important lady in the Tintin Adventures, namely Signora Bianca Castafiore of La Scala, Milan. The first contact with Tintin is not really a success. Tintin has never heard a voice like this. Fortunately, the car windows are shatter-proof. Our intrepid reporter escapes when he has the chance. How could we have survived without Bianca Castafiore? As Hitchcock often had a cameo role in his films. Hergé did the same in his stories. But it was not systematic. In King Ottokar's Sceptre, Hergé appears twice. 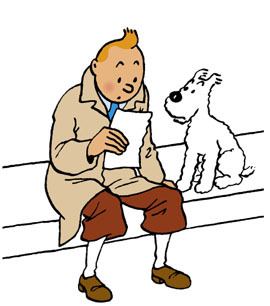 He is present when Tintin is arrested by the Royal Guards and later on during the presentation of the order of the Golden Pelican to Tintin by King Muskar XII. "The Sceptre actually exists and even Hergé was not aware. In 1976, while restoring Saint Vitus Cathedral, within Prague Castle, certain royal possessions of Ottokar II, King of Bohemia (1230-1278) , were discovered. Yes the Sceptre exists and is a real treasure dating back seven centuries..." (Numa Sadoul, Tintin and I, Ed. Casterman, p155) . I love this album ! Page 19. Yes. On any of my apple devices, sadly this page is just not downloading the pictures. @parsifal. We will fix this very soon and you will be able to download the new version. Again sorry for this inconvenience! One of my favourite stories, however this digital version seems to be missing the pictures on page 19, they appear in the thumbnails but not on the main page. Have tried re-downloading and using different devices but still missing. I ve always loved this story. I am however noticing a number of differences in these translations vis a vis the Books that I have which were translated into English by Leslie Lonsdale Cooper. And the speed at which you are releasing these books on the Tintin site in the English translations should be much much faster especially considering that they have all been translated a long time ago! When is the video coming on?